The weather is changing and haunted houses are opening. And oh my, pumpkin pie ice cream is to be had. Plus it's time to find some great books and get the chance to win big in this fun web hunt. delivered by Amazon. com. Check your email and spam folders. Won a gift card to add to my balance. Yea! Helps with the gift giving. Thank You. Love the hunts, keep them coming. On Nov 08, 2017, AbbyKat said: Thanks! Thanks to NOR and all the sponsors. Thank you for the gift card. Yay! More books in my future! woo hoo! thanks for the gift card. On Nov 08, 2017, Adnor said: Hallowpalooza hunt! Thanks to you and the wonderful authors and all your hard work! On Nov 08, 2017, Mberbeza said: THANKS!! Thank you so much! It is very much appreciated! Thank you so much and Congrats to all the winners. On Nov 07, 2017, Juli H said: Yay!! On Nov 07, 2017, Carol Schmoker said: Thanks for giftcard! I'll use it for more great ebooks. On Nov 07, 2017, KarenH said: winner! Saw my name listed as a prize winner. Thank you so much. Big congratulations to all the winners of this fun scavenger hunt contest. Keep 'em coming, NOR! Love these things. On Nov 07, 2017, flchen said: Thank you! On Nov 07, 2017, witchhazel said: Hallowpalozza! Thank you so much for my prize! On Nov 07, 2017, davisbk said: Thank you! I've been hunting here for age. I love how the hunt helps me discover new authors & books. +great prizes. I discovered: Tenaya Jayne, Teri Riggs, Ginny Sterling, Mia Jo Celeste, Lisa Dawn Wadler. On Nov 01, 2017, Nonacuddles said: Loved it! Took awhile, but loved the challenge. Zoe Dawson . All them sounds awesome to read. I like finding new books to read. Am a fan of Celeste Prater, Erin Leaf and Zoe Dawson. On Nov 01, 2017, flchen said: Halloween Fun! Thanks for the chance to learn more about so many terrific authors and their books! A few I'm excited to be following include Elle Boon, Katee Robert, and Teri Riggs! New fav authors Sedona Venez, Ravenna Tate & Katee Robert. Loved adding lots of new books to my TBR list. As usual I enjoyed discovering new authors, looking at covers and reading blurbs. Katee Robert, Samanthya Wyatt, and Ella Quinn. I love getting to see all the different authors/books! Love this site. Awesome giveaway. New authors would be Litta Harris, Teri Riggs and Erin Leaf. I love these events to find new authors. Always fun to discover new books for the TBR list. Zoe Dawson, Sharon Buchbinder, and Ella Quinn. My favorite part of this event was getting to check out so many books. I am now a fan of Jane Ederlyn, Teri Riggs and Lita Harris. This is always a lot of fun. Susannah Sandlin, Katee Robert, Sam Cheever. Wild Man's Curse is a great read! On Nov 01, 2017, Wiccachic said: HallowPalooza 2017!! My favorite part of the event is finding buried treasures although I want to explore more expansive loves as well (LGBTQ) or even asexual love/romance or how the aromantics get through life ^_^. Some of the treasures I've found though without getting too close to typical/trope are: other than - mia jo celeste; the panther's lost princess - mckenna dean; song of the ancients by sandy wright; curve couture - h.m. irving; and dragon in the garden - erika gardner. I enjoyed discovering new authors. This is always so fun. Zoe Dawson, Sarah Marsh and Elle Boon have won me over! I've had fun with this. I really enjoy this type of contest! 1) I loved reading all the different blurbs and finding each word. They are Lots of Fun and I find new Authors and lots of great books to read. There are a lot of prizes too. 1) the event is exciting! This was an easy, schmeazy scavenger hunt! Got to work through a lot of book blurbs of books I haven't yet read. I wasn't familiar with Ruth A. Casie, Jane Ederlyn, or Chris Marie Green before. Will look into their books in the future. Thanks for the opportunity! 1) Tell us what you liked best about this event. 2) Name at least 3 authors that you are now a fan of. The hunts are an easy and great way to find new reads and authors! Hard to pick just 3: Teri Riggs, Danica Winters, Sharon Buchbinder. Thank you Tammie for all you do for us! 1. like discovering new books and authors. On Oct 31, 2017, proudarmymom said: Books, books and more awesome books! I can't wait to read the books by Tami Julka and Brenda Trim, Cecy Robson, Traci Douglass and Erika Gardner. On Oct 30, 2017, huntressjenn said: Happy Halloween! I like these scavenger hunts because I always find new books and authors I want to read. My fave authors from this hunt are Tenaya Jayne, Elle Boon and Celeste Prater. On Oct 30, 2017, Missyb0103 said: I love these contest, i always find new authors. I liked learning about new books and new authors. The authors I am now a fan of are H.M. Irwing, Danica Winters, and Teri Riggs! 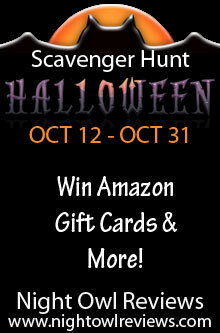 I like the scavenger hunt because it's a great way to find new authors. I am now a fan of Traci Douglass, Zoe Dawson and Juliette Cross. On Oct 30, 2017, wyndwhisper said: Happy Halloween Everyone! I always have fun looking up all the new books and authors during the scavenger hunt. I liked that I could learn about all the new releases of so many of my favorite authors in one stop. Three of those favorite authors are Sharon Buchbinder, Tory Richards, and Brenda Trim. I love any type of scavenger hunts but this type of book hunt introduces you to new authors and genre's you may not have thought to explore. I will be checking out Tory Richars, Neely Powell and Elizabeth McKenna. Thanks. Loved the scavenger hunt, getting to learn about new books and the chance at some awesome prizes. Now a fan some new authors: Shiela Stewart, Susannah Sandlin, Jane Ederlyn, Sharon Buchbinder, and Chris Marie Green. Several others have works that I'm adding to the list in my reading endeavours. On Oct 29, 2017, jtouchstone said: Oh so many good ones! Hope to win, so I can indulge! 1) What I liked about this event is finding out new books via the scavenger hunt. It is definitely fun; long but fun! 2) Fans of: Jane MacGregor, Ella Quinn, and Katee Roberts. On Oct 29, 2017, CozmicBookishJunkie said: Amazing Authors! I liked finding new books and authors that interested me. On Oct 29, 2017, nadinemccarthy said: I love night owl paranormal. I enjoy the treasure hunt aspect of these contests. I like to guess what the word in the blank will be and then finding out if I was right. Some of the authors I'm excited to check out their books are Brenda Trim, McKenna Dean, and Sheila Stewart among others. I am now a fan of the following authors,Ashley Farley Sam Cheever,Sharon Buchbinder and Zoe Dawson. Thanks for the chance to win such a great contest!It took time but if I win I be so happy.Happy Halloween!??? Love these contests as they're a great way to be exposed to new to me authors. Among others I've added Janna MacGregor, Danica Winters & Samanthya Wyatt to my list. What I liked best about this event was finding authors I haven't read before and made me want to start reading their books. After reading all the authors blurbs I found some books that sounded good to me. The authors that I am interested in are Neely Powell, Elle Boon, Sharon Buchbinder, Ashley Farley, Juliette Cross, Ella Quinn, Janna MacGregor, Lita Harris, Samanthya Wyatt, J. Lynn Rowan, Elizabeth Mckenna, Ginny Sterling. On Oct 29, 2017, Sandiebuck said: Love this! Love finding new authors and books, plus it’s great fun! This contest had mostly new to me authors so I like expanding my list of authors to try. That being said, I will put Ravenna Tate, Sarah,Marsh, and Nancy Gideon on that list. Chris Marie Green was one of the few that I had heard of. I don't know about being a fan yet, as I would need to read the book(s) first, but I was intrigued by Sedona Velez's story as well as Ella Quinn's and Danica Winters'. Thanks for the great giveaway, it was lovely to see so many intriguing titles to add to my TBR mountain! This was a fun way to find new authors. Some new authors I found are J. Lynn Rowan, Elizabeth McKenna and Maria K. Alexander. I loved this and found lots of new authors and books to try.This is such a great way to do that.Thanks! I like discovering new authors. I’m excited to read the books of Zoe Dawson, Sandy Wright and Brenda Trim. I love finding new authors. Sam Cheever, Cecy Robson, and Zoe Dawson to name a few. I like finding new authors and books to read. Some new to me authors that I'm interested in reading their books is Elle Boon, Brandi Evans, and Sarah Marsh. I'm not really into paranormal, so there were a couple of books that weren't that I was interested in. On Oct 26, 2017, Purpleunicorn said: Great Scavenger Hunt! I love finding autors I didn't know about before these hunts. I'm looking forward to reading books from Ella Quinn, Susannah Sandlin, and Jodi Vaughn. Thank you for this awesome website that gives me new authors to learn about and including Elle Boon, Brenda Trim and Chris Marie Green. Thank you for the contest as well. On Oct 25, 2017, angienb said: Likes! I liked this because I got to find new-to-me authors...the ones that stood out for me were Juliette Cross, Sarah Marsh, and Ashley Farley. Thank you! I liked most reading the exceprts. I love to take part in scavenger hunts as it is a good way to discover new authors and of course winning gift card prizes. Some of my favorite authors are Elle Boon, Ella Quinn, Janna MacGregor, Katee Roberts. 1. Love finding new mystery authors. 2. Brenda trim, katee Roberts, and Ella boon. On Oct 24, 2017, SylveTReader said: i love these! I love these scavenger hunts!! some authors: Ginny Sterling, Jorge Goyanes, Samanthya Wyatt, Katee Robert, Tenaya Jayne. On Oct 24, 2017, Sylvie said: Always something new! I always find something new with each of these scavenger hunts! This time around, I look forward to reading Wild Man's Curse by Susannah Sandlin (I loved her Penton Vampires series! ), Bedeviled and Beguiled (the blurb made me laugh out loud!) and Curve Couture by H.M. Irving. I really enjoyed learning about new books i haven't read yet. Some of the blurbs were very enticing and made me want more. The three authors that stick out for me are, samantha jacoby, Sky Purrington, and Ravenna Tate. Some of my favorites are, Elle Boon, Brenda Trim and Tami Julka, Zoe Dawson and Elizabeth McKenna. I send thanks to all who participated in this event! I loved discovering so many new authors and books. Three authors I've become a fan of are Shirley Penick, Lynn Hubbard, and Mia Jo Celeste. Elle Boon, Sarah Marsh, and Zoe Dawson definitely got my attention. From the covers to the teasers I'm drawn in. I love these Hunts for exposing me to new authors and genres to enjoy. Books to read! I am so excited for so many of these! I'm going to start with Lita Harris, Elle Boon, and McKenna Dean, but will read from all of these authors! Thanks for the fun! I love NOR's scavenger hunts and look forward to them. I find new authors are reads. This time around, I can't wait to explore Tori Richards, Erin M. Leaf, Terri Riggs, and Zoe Dawson to name a few! I love learning about new authors and discovering new books. Thank you for the fantastic opportunity. I like learning about new books. What I like best is having to read descriptions of books from authors that are new to me! I've already one clicked or put several books on my wishlist! 3 authors I'm now fans with are Katee Roberts, McKenna Dean, and Sky Purington. Thank you for this awesome giveaway and Happy Halloween! ?? I enjoy these contests because I get to find new stories and new authors and I like the Amazon gift card prizes and many people have a chance to win! I found new authors including, H.M. Irwing, Teri Riggs, Katie Robert, and Stone Alexander. Brenda Trim & Tami Julka, Elizabeth McKenna and Janna MacGregor. Thank you so much for the chance! because they give me a chance to find new books, as well, as new author. I typically only read romance, and it's great that some of my favorite authors participate in these events. But, I found a few night authors to try, one of which is not my typical read. I purchased book 1, Of Flame and Light: A Weird Girls Novel (Weird Girls Flame), and hope to read book 2, Of Flame and Fate: A Weird Girls Novel (Weird Girls Flame) (this is the book featured), when I complete the first book. The Right One - One and Only Series, #1 by Samantha Wyatt is my typical read, but a new author for me. I'm reading this book on Kindle Unlimited. And, Magnolia Nights by Ashley Farley, is a new author, and not my typical read, but looks so interesting. So, this event was a great success in my book. Thanks so much. I enjoy the contest itself. I like looking up the missing words. Love this because I am always finding new to me authors. McKenna Dean and several others. DPDbookworm thanks for your info. I've went in and made the update. It was a middle initial problem. Love this scavenger hunt! I enjoy finding new authors and reading the summary of their books. Nancy Gideon, Susannah Sandlin, and Ella Quinn are three authors I have added to my tbr list. Thanks for sponsoring this fantastic event. I like scavenger hunt contests, but I thought you'd want to know that as I was working my way through the Rafflecopter form, I noticed both a typo and a wording error right in the chosen sentence for Turo's Fated Mate. (The full blurb *twice* misuses an either/or structure, not even just this once! Looking forward to more of these scavenger hunts — keep it up! love this contest - interesting books! j. lynn rowan, teri riggs, stormi alexander. I love having to look around finding the missing words and finding new authors. On Oct 17, 2017, minimim said: This is my first time on the hunt ! This was fun ! I found a few PNR writers I had not heard of so win for me already !! Thank you !! I always like these hunts and learning of new authors. Three novels and authors that caught my attention: The Draig's Wife by Dawn Wadler, Operation Wolfe: Gunner by Sedona Venez and Curve Couture by H. M. Irwing. I hope to be checking these read out soon! 2.) Elizabeth McKenna, Sky Purington, Mia Jo Celeste, and Juliette Cross. I like finding new authors. I love finding new authors/books. Sarah Marsh, Sedona Venez, and H. M. Irwing. This is my first time doing the scavenger hunt, and I really enjoyed it. Thank you, I got to see new authors like; Nancy Gideon, Sheila Stewart, Tara Fox Hall, & Brandi Evans just to name a few, and to reconnect with favorite authors like; Sam Cheever, Sedona Venez, & Elle Boone etc. I like discovering new authors. Sam Cheever, Sharon Buchbinder and Danica winters are three authors that interested me. On Oct 15, 2017, DebbyG said: Great Fun!! I love this contest as I always find something for me to enjoy. There are so many authors I like so I picked three I was not familiar with but want to be - Jorge Goyanes, Juliette Cross and Erika Gardner. What I love most is getting to know new authors to check out. The authors I want to learn more about are Zoe Dawson, Teri Riggs and Lynn Hubbard. I never knew there was so many. On Oct 14, 2017, Tashia Jennings said: Wow! So many absolutely wonderful books and authors!!! Would love to win the books alone. Thank you for this awesome fabulous incredible giveaway opportunity! I love discovering new authors through these scavenger hunts. I love finding new authors and books. New authors for me would be Ella Quinn, Sam Cheever, Zoey Dawson and many more. and Danica Winters. I forgot that in the first post. Found lots of new authors and interesting stories. Thanks!!! On Oct 14, 2017, MzVeeAye said: Always lots of fun! I'm always looking for new authors. Erin M. Leaf, Lita Harris, and Elle Boon. I love that I get a peek a New to Me Authors and can Add them to my need to read lists. Mahalo for the Opportunity ?????? I like how it's so easy to find new authors in the genres I like. I'm now a fan of Ella Quinn, Janna MacGregor, and Samantha Wyatt. I like the books. These authors sound interesting. I love how easy the hunt is to participate in, the three authors I chose was hard because all of the authors seem great but here are my three: Ellen Boon, Erin M. Leaf, & Tory Richards. On Oct 13, 2017, LeonieT said: Books galore! So many new authors but to mention a few...Erin M. Leaf, Brenda Trim, Ravenna Tate, Celeste Prater, Sarah Marsh and Stoni Alexander. I love the hunt for new books but winning a gift card to buy these books is even better. I enjoyed reading the different blurbs for books and found some new authors. Samantha Jacobey, Janna MacGregor, Ella Quinn, and Teri Riggs. There were a lot of interesting books. On Oct 13, 2017, Didi said: I love scavenger hunt! The fun in hunting for the answers while browsing among authors/titles, familiar and new. Among my new favorite authors on this event are Katee Robers, Ella Quinn, and Juliette Cross. Love discovering new to me authors. Added to my authors list: McKenna Dean, Ashley Farley, Ellen Boon & more. On Oct 13, 2017, petuniag said: I love these hunts! I love finding new authors, and scavenger hunts. Ashley Farley, Katee Robert, Elle Boon. Thank you for this chance! On Oct 12, 2017, ElizrdbthSpeaks said: new 2 scavenger hunts, hi! 1. I really like getting tantalizing glimpses of each of the books. The sentence was often enough of a hint about a book that I actually read the whole summary, even after I found the missing word. 2. I am now a fan of Tenaya Jayne, Neely Powell and Sandy Wright. Thanks for another spectacular hunt. Love the blurbs on the Author's page for fill.in the blank , because they list their other books as well. 1.Love finding new authors and books. Happy Halloween everyone, Good Luck, Thanks to all the amazing authors who participated. Thanks for another fun Hallowpalooza. Among others, I am a fan of Elle Boon, Danica Winters and Sam Cheever.